Just read about this three programs over @ lifehacker and as far as i can see they are portable. and if indeed portable can submit them to the database. Orzeszek Ratings is a utility to sync ratings and play counts between Windows Media Player and iTunes. 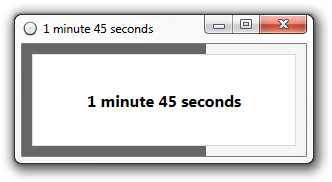 Orzeszek Timer is a basic countdown timer for Windows. Just enter a time in just about any format, and hit Enter. Orzeszek Timer will count down to zero and, optionally, notify you with an alarm. Orzeszek Transfer is a simple file transfer utility that allows you to send larger files to anyone with a web browser without using buggy IM file transfers. Please move to "Freeware that are not portable" sub-forum. Thanks. I am Baas wrote: Orzeszek Transfer is at version 2.5. Interesting. Shame it doesn't support UPNP or encryption. According to the FAQ, DotNET v3.5 required. Midas wrote: Interesting. Shame it doesn't support UPNP or encryption. According to the FAQ, DotNET v3.5 required. Also requires an external port, which is probably more than most users are comfortable setting up as it requires admin access to your router and knowledge to set that up. Orzeszek Timer has been renamed to Hourglass - http://chris.dziemborowicz.com/apps/hourglass/, latest version version of Hourglass is 1.1 but older versions are also available for download. Hourglass now requires .NET 4. Orzeszek Transfer is among my favourite programs. The animation really grabbed me and when I started digging through the features, I wanted to catch more of them. I also really liked the natural language entry format (1 year, 7 minutes, etc.). Last edited by smaragdus on Sun Jul 15, 2018 2:39 pm, edited 1 time in total. I added Hourglass to the database. I'd almost forgotten about this one. There are a ton of cute programs like this for mobile devices but you so rarely see them on the desktop side and open source. Thanks to billion for updating the release date and removing the unnecessary installer version changelog note of Hourglass. Slipped by me when updating the entry to the latest version, was a bit tired. Have a whole directory of shortcuts for custom preset Hourglass timers that draw from daily, continues to be a standout program. All the interface tweaks and other goodies under the hood are rapidly making this part of my normal program set. The way the bar gradually fills up in the task bar is hugely useful to see where I am in a process or as I'm approaching a deadline.